Digitization help student to explore and study their academic courses online, as this gives them flexibility and scheduling their learning at their convenience. Kidsfront has prepared unique course material of Numerical Ability Percentage for UIIC ASSISTANT RECRUITMENT student. This free online Numerical Ability study material for UIIC ASSISTANT RECRUITMENT will help students in learning and doing practice on Percentage topic of UIIC ASSISTANT RECRUITMENT Numerical Ability. The study material on Percentage, help UIIC ASSISTANT RECRUITMENT Numerical Ability students to learn every aspect of Percentage and prepare themselves for exams by doing online test exercise for Percentage, as their study progresses in class. Kidsfront provide unique pattern of learning Numerical Ability with free online comprehensive study material and loads of UIIC ASSISTANT RECRUITMENT Numerical Ability Percentage exercise prepared by the highly professionals team. Students can understand Percentage concept easily and consolidate their learning by doing practice test on Percentage regularly till they excel in Numerical Ability Percentage. If Ram got 30% marks and failed by 15 marks and Mohan got 40% and scored 35 more than pass marks. What is percentage necessary for passing ? Solution Is : Let maximum marks be x, then Given, Ram got pass marks = 30% of x + 15 = x * 30/100 + 15 Mohan got pass marks =x * 40/100 - 35 According to question, 3x + 150 = 4x - 350 x = 150 + 350 = 500 pass marks = 500 * 3/10 + 15 = 165 Necessary percentage for passing = 165/500 * 100 = 33%. 5 kg of tea and 8 kg of sugar together cost 172 ₹. The price of tea has risen by 20% and that of sugar by 10%. Hence the same quantities of tea and sugar now cost 199.20 ₹ . What is the original price of tea per kg ? A sum of 6100₹ was divided among 8 men, 10 women and 12 children in such a way that each man received 25% more than a woman and each women received 25% more than a child. How much did each woman receive ? Solution Is : Let woman received be x Man received = 125/100 x = 5/4 x and child received = 80/100 x = 4/5 x then 8 x (5/4 x) + 10 * x + 12 * ( 4/5 x) = 6100 148/5 x = 6100 x = 6100 * 5/148 = 206.08. A shopkeeper sells his goods at 10% discount on the marked price. What price should he mark on an article that costs him 900 to gain 10% ? 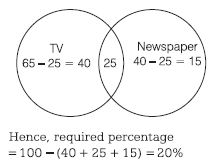 In a survey of a town, it was found that 65% of the people surveyed watch the news on TV, 40% read a newspaper and 25% read a newspaper and watch the news on TV. What per cent of the people surveyed neither watch the news on TV nor read newspaper ? The weight of the container alone is 25% of the container filled with a certain fluid. When some fluid is removed, then the weight of the container and the remaining liquid is 50% original total weight. What fractional part of the liquid has been removed? A machinist, by increasing his normal rate of work by 12 1/2% could produce 15 items more in a given period of time. How many times can he produce if he works at 80% of his normal rate? Which single discount will be equal to two successive discounts of 12% and 5%? A book seller gives 12% discount on the printed price. What does a customer pay for a book with a printed price of ? 75?